You can purchase the 63-page literature guide PLUS a 53-slide interactive Jeopardy-type game for The Great Shelby Holmes for immediate download! $19.95! Move over, Sherlock Holmes, there's a new detective in town! She's even named after you and has named her dog Sir Arthur after your creator, Sir Arthur Conan Doyle! She's not from England like you, but she does live in a neighborhood known for crime in New York. She's quite a bit younger than you ... nine years old in fact, but because of this sassy little redheaded detective's advanced intellectual skills, she's skipped several grades. She's spunky, independent, and bossy. Like you, Master Detective Sherlock Holmes, Shelby studies crumbs of clues, expressions of people, motives that move them, words that aren't said, and opportunities that present themselves. She uses logic, measures, remembers, predicts, and confirms. Detective Shelby Holmes is known throughout her New York Harlem neighborhood as the best, tiniest, detective who has ever solved crimes. This nine-year-old sixth grader who stands only about four feet tall may look like an unlikely sleuth, but her problem solving skills make her a stand-out. From analyzing graffiti on a store's facade to solving the most difficult of crimes through her uncanny powers of observation, Shelby gets around! She usually works alone but things begin to change when John Watson moves into the downstairs apartment. John Watson has grown up in a military family, so he moved a lot and has learned to be responsible, friendly, polite, and well-disciplined. He and his mother moved into a Harlem apartment after his parents' divorce, but neither artillary fire and bombs going off could have prepared him for the upstairs explosion that shook him as he unpacked. So enters the scientist Shelby Holmes who introduces him to her Harlem neighbors and surprises him with her ability to solve problems and analyze people while seemingly unable to make real friends. Shelby has a hopeless sweet tooth, but can even deduce that John Watson has diabetes. When a dognapping case presents itself, Shelby jumps on it quickly, but this time she enlists "Watson" as her sidekick and apprentice. You can join the two as they dive into the case of a prize-winning showdog who goes missing before the big show. This mystery will inspire you to sharpen your powers of observation and friendship-building skills! The 63-page Kids Wings literature guide PLUS interactive Jeopardy-type game, perfect for lesson plans, handouts, or projection on your SmartBoard, is now available. 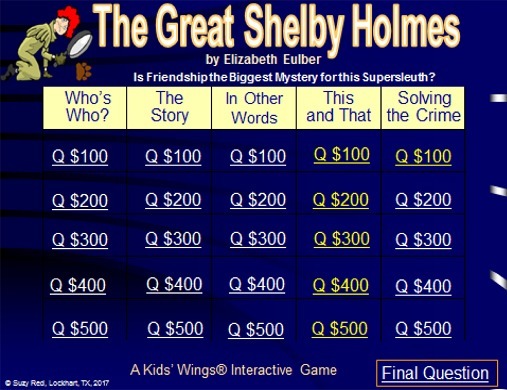 And an interactive Jeopardy-type Culminating Game! Buy The Great Shelby Holmes NOW! Order your class sets of the book HERE to get the book at a discount!